Have I said that I’m a huge fan of Glee? Well I am. Actually I am obsessed. Not so obsessed that I buy merchandise or wait in line for hours to be a free extra, but pretty obsessed. Have I said that I have connections? Well I do. Yes, Cory Monteith is my cousin! No, I’m lying… but I have a connection and I got to go watch a taping last Wednesday!!! I am a 27 year old woman. I am not a teenager. However, I am such a huge fan of the show and I think this kid is just so adorable. I think the whole cast is adorable. And Amazing. And hilarious. And talented. It was so fun. I didn’t get to meet anyone and I couldn’t take pictures (we had to pretend we were cool and not super duper stalker fans), but I did get to see most of the cast in person, standing just a few feet away from me at times (wow, I sound crazy). 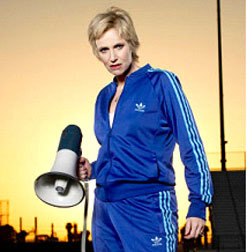 Jane Lynch, who plays Sue Sylvester, was by far the nicest cast member. Now you’re thinking, “How do you know? You didn’t even meet her.” I could tell by how she reacted to those random people who did go up and say hi. There were little kids there too, who were probably sons and daughters of the crew, and she was so nice to everyone. She would talk to people and ask them questions. She seemed like she really cared, even though she probably just wanted to get back to the book she was reading between takes. Lea Michelle was, just from my observations, the least friendly to randoms (people who just came up to her to say hi). She was, however, SUPER friendly to other cast members…..
Mathew Morrison is dreamy… but he had a rather large head in person… literally, not figuratively. Diana Argon looked exactly like she does on TV. Chris Colfer rushed past us on our way in. Kevin McHale can walk! It’s a miracle!! Amber Riley was playing with her shiny new iPad – the whole cast got them as gifts. Jonathan Groff was performing on stage almost the whole time we were there because they were shooting the Vocal Adrenaline performance (for those non-gleeks out there, VA is the rival Glee club). We waited around for.ev.er to see a performance with the main cast, but it was 8:00pm when we realized we hadn’t eaten dinner and wanted to be ready for work the next day. I was just happy to be there and get to see these people, who I watch on TV every week, in person. Eeek! I'm squealing in excitement over here. I'm a huge Glee fan and that just sounds so amazing. I hope you get to go again sometime!